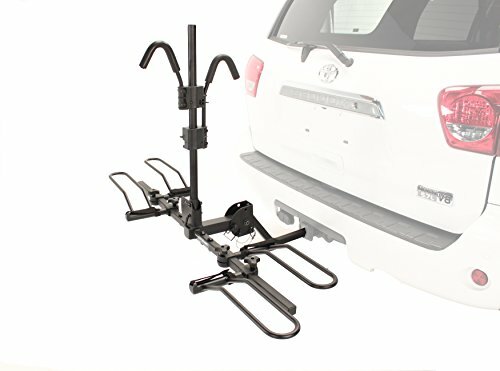 This heavy-duty platform-style bike rack mounts on a 1.25- or 2-inch hitch and folds flat against the back of a vehicle when not in use. The rack uses padded universal top clamps and adjustable wheel holders. Bikes need simply to be dropped into the wheel holders and clamps slid down onto the frames. Velcro wheel straps add security. The rack carries a limited warranty against defects. Hollywood Racks started in 1973 when they began making trunk racks in the back of our bike shop in Hollywood, CA. As a retailer, the company knew exactly what people needed: good quality products that were easy to use. They earned a great reputation fast and began selling racks to other dealers, and later to the bike companies. Today, Hollywood Racks builds racks the only way they know how: simple, strong, and secure. Hollywood Racks are built with top-quality materials including high-strength steel, aircraft-quality fasteners, and thick powder coats to withstand the elements. Generous amounts of padding protect bikes and cars, and all of their products are fully covered with a limited warranty. The company's products continue to receive accolades from all the major outdoor sports magazines, and are in demand by everyone from recreational cycling families to weekend warriors to race teams on the road and off.